Free Comic Book Day (FCBD) comics are such silly things. Sure, it’s fun to see your local comic shop overflowing with people, all lined up to get free stuff from publishers that normally ask at least four bucks for a monthly book that’s one-third ads. 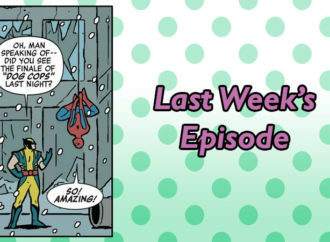 I’ve always had jobs that involved working Saturdays and have never failed to feel bummed out when I miss FCBD, and I’ve only been reading mainstream comics for a handful of years! But, let’s be real: FCBD floppies are advertisements, meant to get us to shell out more money for more comics. 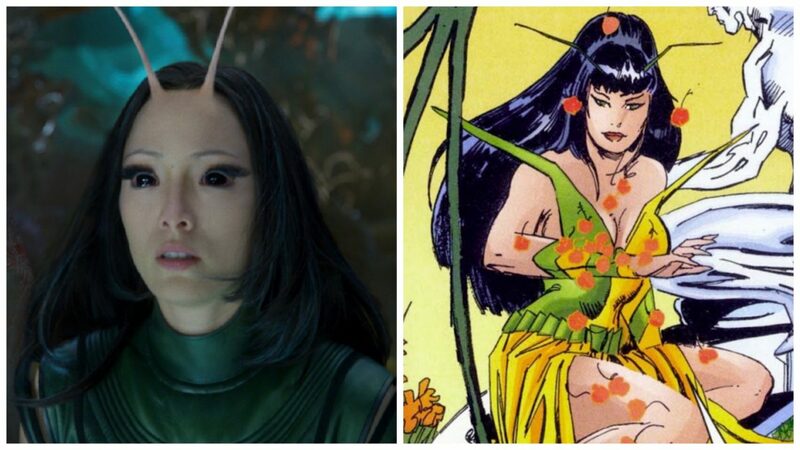 Of course, we love comics, and we’re going to shell out for them anyway. So, ad or not, it’s nice when a FCBD book does its job. Scott Westerfeld more elegantly expresses this goal in his introduction to Spill Night, a free comic that serves as a prequel for Spill Zone, his upcoming graphic novel about a city in upstate New York that has experienced some kind of strange, apocalyptic incident. 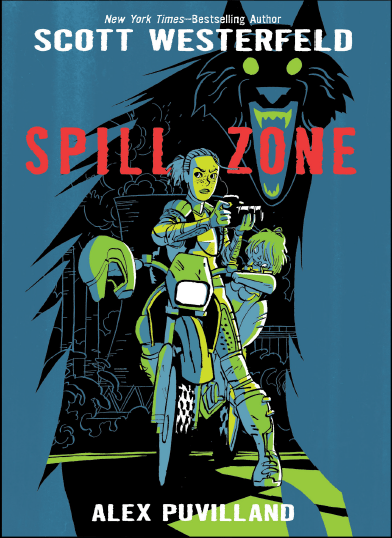 First Second has actually been serializing Spill Zone online for quite a while now, allowing readers to get through quite a bit of the story before it hits shelves on May 2nd. 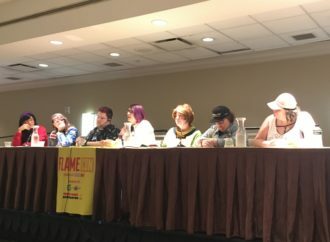 The extra, free offering is an interesting tactic, but one that has proven successful for previous First Second authors like Faith Erin Hicks, and, you know, a whole bunch of webcomic artists who’ve run wildly successful Kickstarters to print their work. 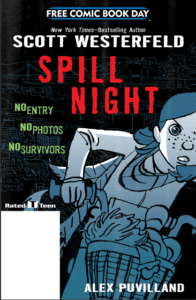 Spill Night’s protagonist is the younger of two sisters–her name never appears on the page, but her older sister’s named Addison–who is home alone when strange, dangerous things begin to happen in their town. An initial glimpse of the young girl’s room suggests what seems like an unhealthy obsession with her doll, Vespertine. There are pictures of the doll on the wall and on her desk, and she hears a voice in her head that supposedly belongs to the doll. Some fantastically jagged lettering implies that Vespertine’s got quite an eerie voice, evocative of classic horror film dolls like the crass Chucky. 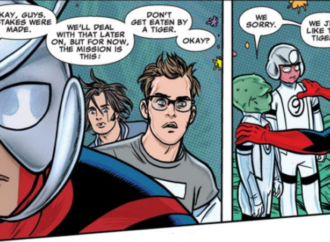 However, the doll is the least worrying creature in the comic. Mysterious neon animals and color bursts reminiscent of the electrical explosions in Jeremy Sorese’s Curveball are wreaking havoc in the girl’s quiet suburb, and she relies on Vespertine for guidance and safety. Despite the presence of familiar horror tropes like disturbingly real dolls, Spill Night feels fresh. The world Westerfeld has created seems to follow fairy tale logic. There are, at least, as of yet, no heroes, only children who know how to survive by following sometimes inexplicable rules. 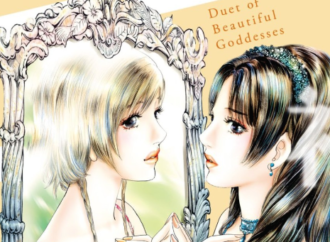 Readers looking for dystopian literature that is atmospheric, but still has exciting action will find this comic quite alluring. 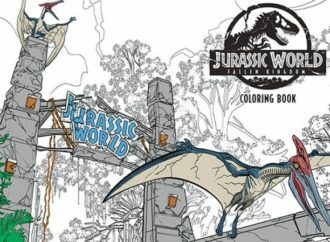 The world-building is pleasantly eerie and very promising. Alex Puvilland’s rough, even anxious linework is perfect for a horror story with child protagonists. Aside from the sharp lettering, the imperfectly straight lines on doors, buildings, and sidewalks add to the sensation that reality is shifting in a dangerous direction. The neon colors that indicate the presence of wrongness are enticing in a treacherous way. Whether it’s cats or abstract lines, the almost-friendliness of the bright blues and yellows suggest that this bad thing will not introduce itself in ways familiar to human eyes. 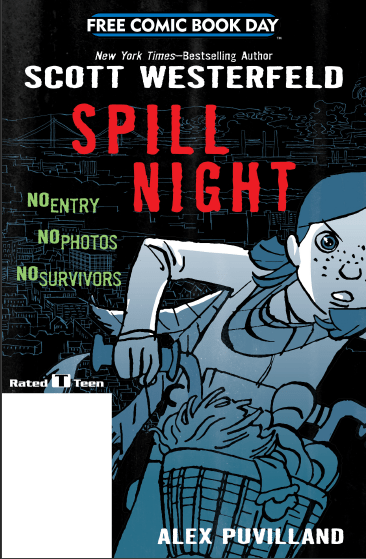 Spill Night deftly accomplishes its goal. I was intrigued by the odd, haunted suburb full of wise but struggling children and teens and wanted to know more about how they were surviving their new world. When Addison–the protagonist’s older sister–finally shows up on her motorcycle, she evokes all that you want from a dystopian teen hero–tough, fashionable, and in trouble–and Westerfeld gives you just enough to leave you wanting her story. 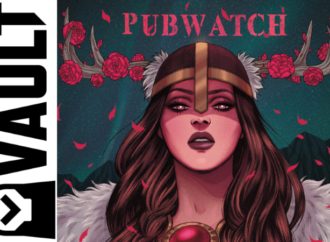 Horror and dystopia fans, especially those that enjoyed Paul Pope’s Aurora West books, should pick up a copy.